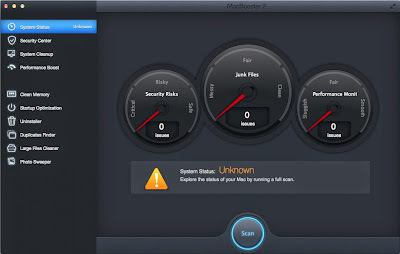 What does Advanced SystemCare 7 PRO do ? Advanced SystemCare 7 PRO provides automated and all-in-one PC care service with Malware Removal, Registry Fix, Privacy Protection, Performance Tune-up, and System Cleaning capabilities. It also creates superior and safer online experience with the latest Surfing Protection and Internet Boost technology, to ensure your top online security and maximum PC performance. Iobit's Driver Booster 2 Pro is here! Does your PC run slower and slower over time? Do you get the strange ActiveX or similar .dll errors? Do you trouble with the annoying pop-up ads of the Internet? Are you troubled with the blue screen, system crashing or system freezing from time to time? Easy Tweaker is The Best Microsoft Windows registry clenaer and registry fix tool designed for Windows© PCs to avoid re-installing the operating system. 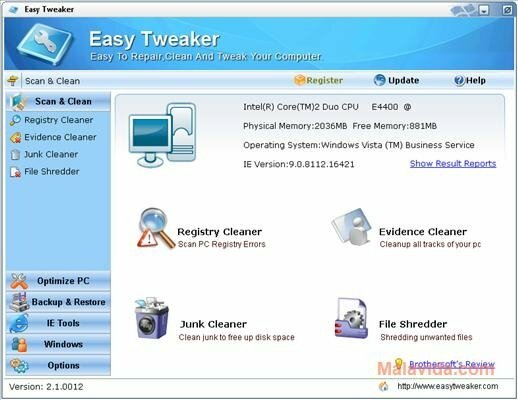 Easy Tweaker is a complete package for your PC care and maintenance that you don't have to go through the hassles of resolving the problems and with Easy Tweaker you can safely clean and repair the registry problems and speed up your computer with a few simple clicks. An easy, simple and smart PDF converter. Convert word, ppt and pictures to PDF. It supports watermarks and automatic memory functions. Green software, converts to non editable PDF to ensure the integral quality of the PDF. Powerful Mac data recovery software to recover deleted, formatted and lost files from hard drive, digital cameras, and USB external drives. Support most of file systems, FAT, NTFS, exFAT, HFS+, and ext2/ext3/ext4 etc. Recover deleted documents, videos, audios, photos and any file formats you want. Easy steps to recover, no technical skills and knowledges needed. High speed scanning to save time for you. Compatible with the latest Mac OS X Mountain Lion. Windows OS support from 98 to Windows 8, including Server and 64-bit versions. Native connection to most popular database servers. Easy-to-use visual query builder to build even complex SQL queries. SQL Editor with code completion and syntax highlight. High-speed data retrieval, quick data manipulations. Portable installation to work from a USB Flash drive. * - available in FlySpeed SQL Query Tool Standard version only. Full support of SQL syntax for Microsoft SQL Server, Oracle, MySQL, Microsoft Jet 4 (MS Access, MS Excel), PostgreSQL, InterBase, Firebird, IBM DB2, Informix, Sybase, SQLite databases. Support of the other ANSI SQL/92, SQL/89 and SQL/2003 compatible database servers such as Teradata, Netezza and desktop databases (Paradox, FoxPro, dBase (DBF)). Native connection to Microsoft SQL Server, Oracle, MySQL, PostgreSQL, MS Access, InterBase/Firebird databases. Connection to any other database via ADO or ODBC driver. Data transfer into already existing SQL Server tables with ability to maintain data actuality afterwards (single-side synchronization). FlySpeed DB Migrate to SQL Server is not a one-time utility but a set of Power Tools to automate your data movement and synchronization tasks. Saving all migration options to a file, you may easily repeat your task in a few mouse clicks. The Command-line tool and the Task Scheduler let you automate your data transfer completely. Transfer data into existing SQL Server tables within the destination database. Generation of SQL Script (Dump) for future execution on the destination MS SQL Server. FlySpeed Data Export is the must-have tool to export data from your database quickly and easily. The ability to export data from almost any database using OLE DB or ODBC, and save data to the most-popular office formats makes FlySpeed Data Export a really universal data export tool. FlySpeed Data Export was successfully tested with all popular database servers, such as MySQL, Oracle, MS SQL Server, PostgreSQL, Firebird and many others. The tool lets you to save data in MS Excel, CSV, HTML, XML, DBF, Text, MS Word, MS Access, Open Document Text and Spreadsheet formats. FlySpeed Data Export is not a one-time utility, but a set of Power Tools to automate your data export tasks. Saving all export settings to a file, you may easily repeat your task in a few mouse clicks. The Command-line tool and the Task Scheduler let you automate your data transfer completely. The Trial version of FlySpeed Data Export does not have any limitations and allows taking advantage of all features of Professional version during the 30 day period. After the trial period, you may still use the Free version of the product at unlimited time and export your data without any restrictions! One-click Cleanup features to clean any file just in one click that caused you Mac system slow. System Cleanup. Remove all junk files and free up the space of your hard disk. Smart Optimization. Increase you Mac performance. Performance Boost. useful features is you gaming and multimedia addict. Mac Security. Make you Mac more secure using this tool.